Altro Mondo Arte Contemporanea is pleased to present FRACTALS, an exhibition of new works by artist, Edwin Wilwayco at the Altro Mondo Arte Contemporanea gallery (3rd Floor, Greenbelt 5, Ayala Center, Makati City). The exhibit dubbed “FRACTALS” is described by the writer, Josephine Fatima Martins as “a series” in which “Edwin Wilwayco animates his continued explorations in actualizing conceptual and material holism”. Martins further added that “similar to the artist’s previous visual constructions, Fractals are visceral paintings demonstrating the root plasticity and versatility of paint. At the same time, they are objective abstraction in that they reference forms in nature. 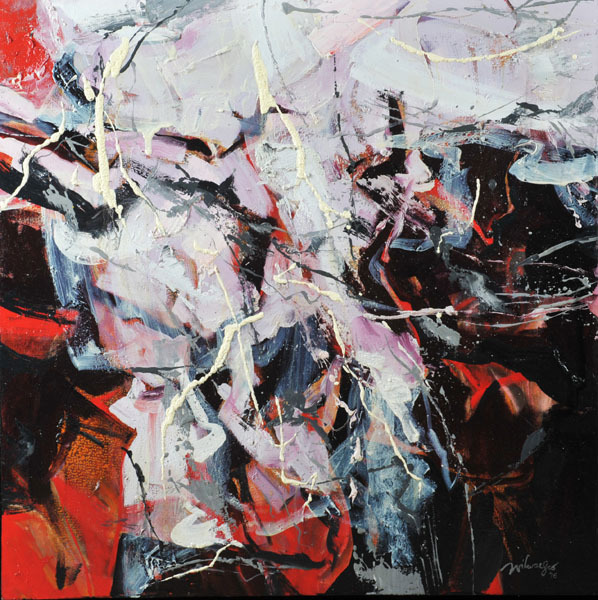 EDWIN Wilwayco has taken a most dramatic shift in his abstract expressionism with his new “Fractals’ series of paintings. After his “Bird of Paradise” and “Four Seasons,” series of works that took their inspiration from flora and clima, that is, from the most colorful and most musically resonant of nature’s phenomena, he has shifted to nature’s geometry, the materiality and mathematics of reality. The result is an intriguing series of works that problematizes representation and gives art aficionados who champion his work an inkling on his creative process and the current state of his artistic mind. His “geometric turn,” if we be permitted to call it that, is apparent in the title of the series. Fractals are useful in modeling structures in which similar patterns recur at progressively smaller scales, such as coastlines, and in describing partly random phenomena such as crystal growth, fluid turbulence and galaxy formation. A French word derived from the Latin “fract,” or broken, the geometric figure is useful for Wilwayco at this very mature stage of his artistic career, because it provides the governing metaphor, if not the trajectory with which, first, to limn or define his art by artistic “analysis,” which is to break down his art in order to see how the parts relate to the whole; and second, to enable him to tackle what is most critical today for a nature artist like him—the brokenness of the environment. It is noteworthy for one that the most ubiquitous icon in the series—the leopard spots—are a mainstay in design; one can see them in upholstery, women’s fashion, and even men’s underwear. But industrial-and-commercial design takes its most creative icons from the environment or from the history of artistic representation of nature. Moreover, Wilwayco’s previous series have adapted themselves to the functional requirements of industrial design. Variants of the “Bird of Paradise,” for example, have been adapted into furniture. But while they assume forms of commercial design, they essentially remain artistic representations of nature. They bring the lines and colors of nature into the living room. We mention the history of artistic representation because obviously Wilwayco considers himself along the line of abstract expressionists, whose pioneers saw themselves as inheritors or challengers of the traditions that came before them. And all artists worth their salt try to break new ground or at least, chart new directions for their art without however abandoning altogether the tradition that defined their art and style in the first place. To be sure, Wilwayco’s new series is along the line of Pollock’s action-paintings, Rothko’s “light-paintings,” Hofmann’s pictorialism and color relationships, and of course, Joya’s “tropicalism.” In contrast to many contemporary artists, Wilwayco modernist art tradition—his overall sense of history—is not puddle-deep. “Fractal details” have been found in Pollock’s drip works, as Martins says. Wilwayco achieves those dimensions in the “Fractals” series which should be seen as such—as a series—so as to better guide viewers to the development of his art. In the initial paintings, the leopard-spot as well as other icons—florals, geometrics—are directly shown and very visible. In later paintings, the spots and other patterns are obscured within spatial depth. In later groupings still, they seem to be erased, restored, and again, defaced and nearly obliterated. The effects are boldness of design and especially for the viewer, a sense of throbbing, kinetic space. Much of the dynamism owes to the bold impastos, the gestural sweeps and style undercurrents, and even the erasures. The erasures provide an intriguing aspect to the works since they constitute the palimpsest that defines not only the push-and-pull, the trial-and-error crescendos of the creative process, but also the archival dynamics that establish the history of the work. In short, the palimpsest points to the construction of “Fractals” and the series that came before it and which may have determined or given rise to the new series. To some extent, “Fractals” is a practice in defamiliarization: it is a venture to seemingly new artistic terrain that is alien to those already familiar with the Wilwayco style. Defamiliarization is a self-reflexive device for Wilwayco to raise the caveat that his art is after all a construction, that whatever its achievements in representing nature through abstraction may be, it is just a representation moored not on any one-to-one correspondence between reality and art, but on a system of codes and conventions that are tacitly agreed between artist and audience. But “Fractals” doesn’t stop at defamiliarization. Contemporary artists invite attention to their art-making not out of critical self-awareness but because of self-absorption and their inherent spinelessness so that they can’t commit to anything outside of their narrow egos. In contrast, defamiliarization is a Brechtian alienation effect that wakes the audience from their willing suspension of disbelief so that, alerted and aroused from the blissful lull they’ve been put into by the dramatic work before them, they can be impelled to critical action. Therefore, by experimenting with “Fractals” and problematizing representation, Wilwayco realizes his second intention—to tackle in his practice the critical concern for the brokenness of nature. It is noteworthy for one that fractals are used in modeling structures such as eroded coastlines or snowflakes, generally vanished landscapes. Many of these landscapes are in danger of sheer effacement and only through models of planning can they be restored or saved. Or will they be effaced again because planning and development are mere rearguard actions to save nature while in fact jettisoning or sacrificing it altogether in the name of progress and development? Do the erasures and the palimpsests in “Fractals” embody this push-and-pull, nay the Janus face, of liberal capitalism? We must add here that the beautiful iconography of the leopard spots points to the danger of extinction facing animals which are poached and killed for their ivory tusks or their beautiful hides. Many of these animals are supposedly protected in wildlife preserves, but their situation becomes evermore precarious especially since their preserves obtain in very troubled hotspots. For example, the beautiful snow leopard’s endangered-species status is always heightened whenever we hear of the violence and chaos in Pakistan and Afghanistan. Such evocations—nature’s beauty and bounty through art’s geometry and the dangers facing it because of man’s concupiscible appetites—make “Fractals” a very compelling series. All this should show that contrary to the rather pejorative connotation of the title of the new series, Wilwayco’s art is not going the way of fragmentation. It is rather going the way of depth, resonance and relevance. Edwin Wilwayco’s “Fractals” is running at the Altro Mondo Arte Contemporanea Gallery, 3/F, Greenbelt 5, Ayala Center, Makati City. Call 5013270 to 71 or e-mail info@altromondo.ph. The 29th one-man exhibition of one of the most critically acclaimed Abstract-Expressionists in the Philippines is opening on November 5, 2015, Thursday 6pm at Altro Mondo Arte Contemporanea located at the 3rd Level of Greenbelt 5, Ayala Center, Makati City. The exhibit runs until November 27, 2015. Edwin Wilwayco is included in one of the 75 portraits of filipino artists in their studios by Pinggot Zulueta launched last October 30, 2015. Get a copy at Fully Booked. Recalibration is featured as one of the 5 must-see exhibitions in Singapore this July. 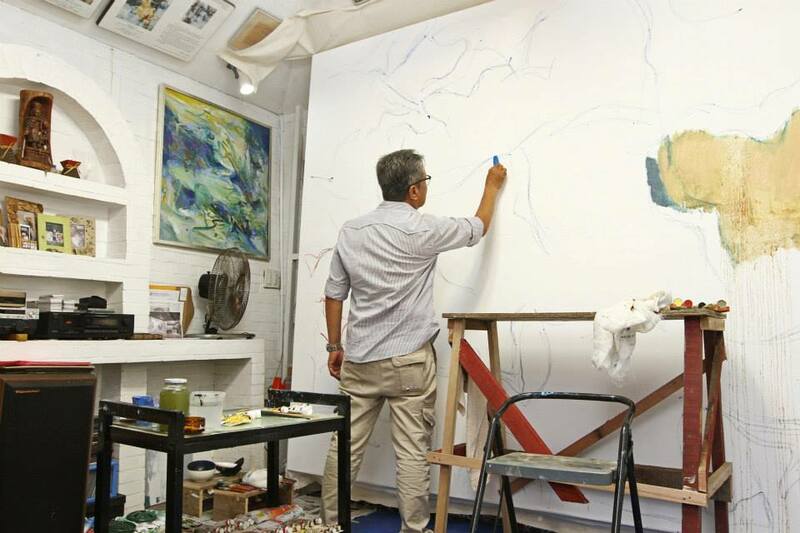 Known very much for his lyrical and eloquent brushworks — a vital aspect when it comes to abstract painting, Edwin Wilwayco’s latest brand of emotive abstractions to Singapore from 8 – 31 July. Conceived over nine months and his two studios in Rhode Island and Manila, the differing approach found in both studios have appeared to blend perfectly, creating new meanings and in turn, dialogue with the mystifying forces of nature — a central theme to this exhibition. A complex yet enduring approach to abstract art involves several techniques such as drips and dribbles of paint, painterly marks, deep passages along with the occasional adding of sand and sack cloth convenes beautifully in an unravelling surface adventure for any viewer. Expect no less than an intense vibrancy and energy from Wilwayco’s paintings. A painter’s praise: “Painting is a lifetime work. I’m just blessed that God gives me the good health to keep on painting every day,” Edwin Wilwayco explains. MANILA, Philippines - From the heart, I ask God, ‘Use my hands, my mind and my eyes.’ I cannot paint or hold my brush without saying a prayer. It is my proper beginning,” the artist Edwin Wilwayco admits, a modest maker looking to his Master as muse. With a prolific, world-renowned career behind him, a total of 14 solo exhibitions to match a lustrous 46-year repertoire, it is hardly believable that the inexhaustible abstract expressionist has not outgrown his pious devotion, to match what some artist as successful as he may have developed, the inflated ego. But Wilwayco has remained steadfast in his divine inspiration, a remnant of which, a prayer, hangs omnipresent on his waiting easel. Wilwayco has gone through a lot of convictions, and while they may not be as recognizably represented in his dynamic brush strokes, strident textures, and vivid palettes, each one is as instrumental as the last. 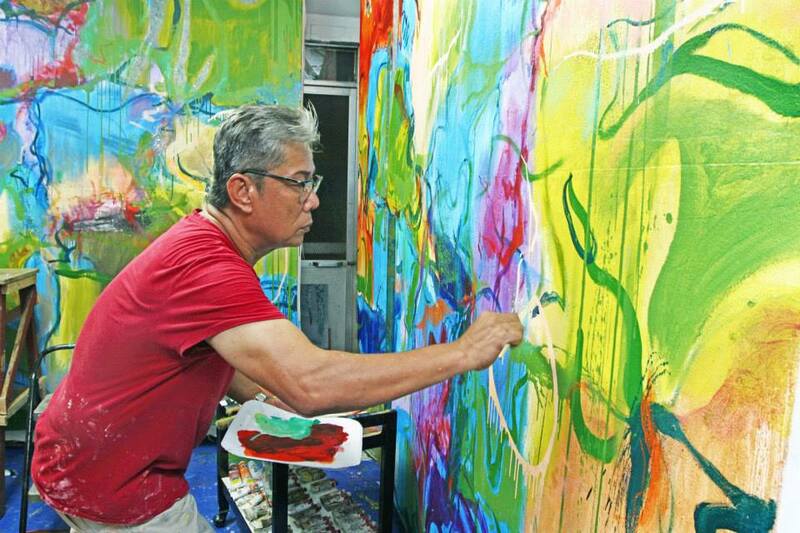 “In 1979, I had a show on the Philippine flag, as my flag series. The flag and its evolution were discernible in my paintings. I was young, and it was a critical success, but I only sold one painting from day one until the third year,” Wilwayco recounts of his first solo exhibition, while brimming with patriotic fervor, his art failing to strike the pulse of national interest. 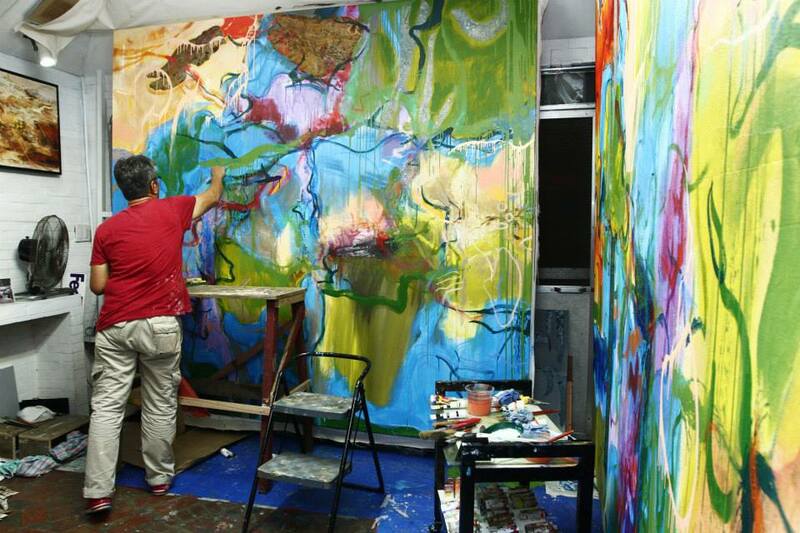 “At that time, I almost gave up on painting and just wanted to concentrate on advertising work,” he adds. If there was one thing good to transpire from it, however, it was Wilwayco’s acceptance as a British Council scholar for painting in 1982. 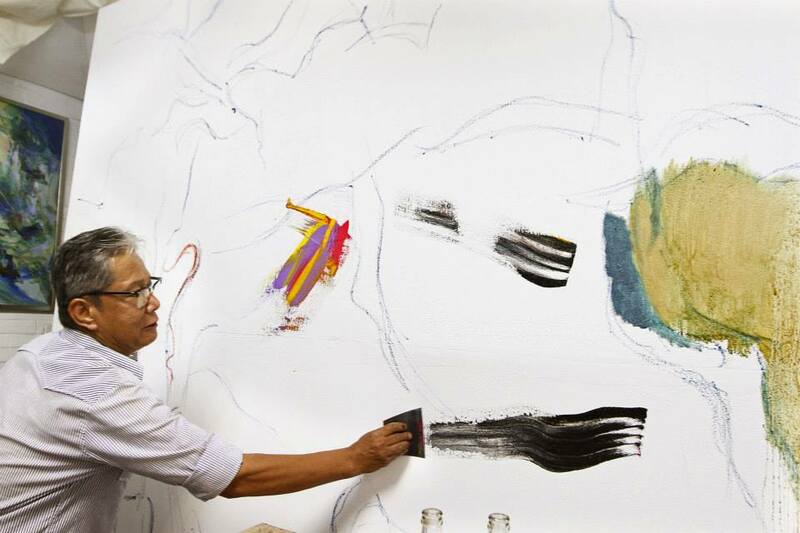 “There, my professor advised me, ‘When you go back to your country, why don’t you look for something very Filipino.’ So I opted to paint jeepneys, and that’s how I came up with my ‘Jeepney Fantasia’ series,” explains Wilwayco, his monumental comeback at the old Ayala Museum preludes the success of his other returns to come. The neon frenzy of jeepneys laden with vinyl stickers and multicolored kitsch, their sculptural quality fashioned off stainless steel offered a fantasy off the Filipino everyday trademark. From there, amidst the tropical landscape of his garden home, Wilwayco started to build on his “Heliconias and Birds of Paradise” series, which too, became a simmering sensation. This newfound fixation on nature has sparked other well-received showcases, his latest one, the “In Nature’s Realm” series which debuted at the Gallery Duemila in 2012. “People don’t realize that even with nature, when you zoom into something like a leaf, it looks so abstract. No one can capture, or be close to the color combinations of nature. There are so many surprises that we tend to ignore. We just have to pay attention to the nuances — the blend of colors, the rock formations, or the leaves in trees,” Wilwayco’s tiny details giving way to monolithic imaginings heaving with fertile life, movement, and emotion. “I’m adventurous; somehow, I like exploration. I always want to change my surroundings,” Wilwayco admits, that his nature series was stirred by the lush landscapes of two opposite continents, one, in his New England backyard, where he spends his time with wife Loby and daughter Moma in their Rhode Island residence, and the other one, in his Paranaque home where Wilwayco has built the verdant oasis of equatorial foliage. On these two coasts, Wilwayco divides his time painting, building an abundant body of work that awaits collectors, critics, and comeuppance. “It’s the only way I am comfortable with. It should come as though I’m not working at all, as though I’m only playing. And the fact that I am able to make a connection with collectors with the paintings that I make is the most gratifying response. As long as I sincerely believe that I am happy doing it, that I pour my heart into it, whether it would take one year or two years for that painting to be bought and appreciated, it has proven its merit, for me,” Wilwayco states, his style never dictated by his success. “I have to please myself, that’s my gauge. I have to rely mostly on my feelings. There’s always this danger when someone sells too well, they tend to stick to a certain formula. I don’t look at my painting as a roll of textile, like, ‘Do you need two yards, three yards?’ You have to offer something different. If you don’t like this particular yard, there is always someone else who will,” he explains. It also helps that the constant spring of inspiration doesn’t run dry for Wilwayco, picking up insights from the wayward branch to the whimsical melodies of classical sonatas. “Music will always be a part as long as I’m painting. I’m moved by music. But I’ve tried, many times, painting with popular music, Broadway, or trance, and they don’t work for me. But classical music, especially orchestra, solo or duets, moves me. It feels like I’m transported in time. I try to emulate the speed, the tempo of these compositions,” he reveals, his “Homage to Vivaldi” and “Scherzo” series a visually-audible response. His penchant for the orchestral and its composers mimics the way he views his talent. “I can say I was classically-trained. I can do portraits, I can do landscapes. When you’re a musician, you can do improvisation if you are classically-trained — whether it’s jazz or popular music. Doing abstract work is a challenge because it’s making a painting I haven’t seen before. I don’t make studies, and it depends on my feeling,” he notes. Like melodies built with the progressions of tones, rhythms, and instruments, Wilwayco composes with a feeling, a flourishing palette, and a flight of fancy; the results are nothing short of symphonic. But just like his Mozart, Schubert, or Vivaldi, he knows better than to over-deliver. “Doing abstract opens up to a lot of accidents. When do I exercise restraint? When do I back off and not meddle too much? If I try to do too much, it will be destroyed,” he confesses, and this ascendency to self-editing has brought to life many quintessential Wilwayco pieces, whether it’s the spot-lit magnum opus at the Chabot Gallery in Providence, or the masterwork mural at the Crimson Hotel. After having exhausted his earthly influences, Wilwayco transcends to the realm of the sacred in giving his latest series a new light. Titled “Recalibration,” Wilwayco’s fresh-off-the-studio collection will be showcased in Singapore this July, and it promises to be quite the revelation. “I am recalibrating in such a way that I am not paying homage to nature anymore. Is it veering towards being very abstract? Is it too mechanical? I cannot imagine what art critics will say or how my audience will look at my new work. Definitely, I can assure you, I will learn so much from how you see it. As long as you like my painting, then I will be very happy with that. You and I will have very different positions, will find different things on my paintings, and I leave it to you to see what you want to see,” he confesses. If you see a sliver of hope, a slice of heaven, or even the face of God, it shouldn’t come as a surprise, because that is the miracle Wilwayco is building on. Having gone full circle from capturing life’s intricacies to the infinite world of the divine, perhaps Edwin Wilwayco has found yet another well of inexhaustible encouragement. “Art will always be a reflection of God’s creation. We cannot even come close to what He created, but we can always offer a sampling. I admire so many artists, and all of them have their own strengths, and you realize that God won’t give you everything, but you have all these artists combined and there is so much wonderful art in the world. God really is the supreme artist,” he states. Photo courtesy of Manila Bulletin's Pinggot Zulueta. If you see yourself at the lobby of Crimson Hotel and find a familiar painting, then it's none other than Edwin Wilwayco's. Friend and photographer Pinggot Zulueta brightens the feature in Manila Bulletin and to Edwin Wilwayco's mural at Crimson Hotel through a photographic chronicle. Get a sneak peak of the latest exhibit at the Chabot Fine Art Gallery in Providence, Rhode Island this September. Visit Wilwayco's Triptych at the Solaire Resort and Casino.